The Mission of the Public Works Department (PWD) is to construct, maintain and preserve a safe, functional and aesthetically pleasing public infrastruture in Doral for the residents and visitors while providing the highest levels of customer service and responsiveness. The PWD is responsible for the maintenance of the roads, public areas and facilities, beautification projects, stormwater utility and the construction management of capital improvement projects. 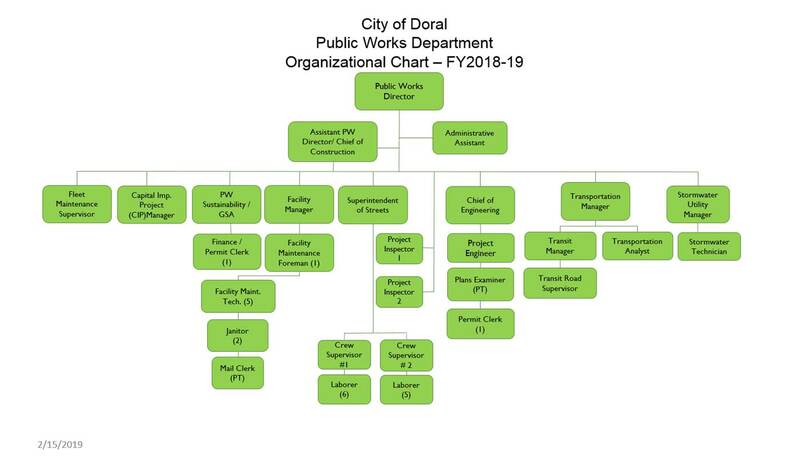 The Department of Public Works also manages the Doral Trolley, the Doral Stormwater Utility, and manages design and construction of capital improvement projects, property aquisition and environmental permitting. The PWD issues permits for all work performed within the public right-of-way while work performed on private property is permitted through the Building Department, which may also need a Public Works sub-permit. The PWD also operates the City of Doral Stormwater Utility to ensure the efficient management of the stormwater runoff within City boundaries. The PWD also, provides administration for projects within the Capital Improvement Plan to facilitate timely and cost effective construction of improvements. The PWD has the responsibility of establishing the Hurricane Plan and coordination with the Police Department and the Office of Emergency Management for response to natural and man-made disasters. See our Huricane-Readiness tips to be prepared. We have established the Adopt-a-Street Program that is a litter removal program, where companies, groups or organizations have the opportunity to adopt a one mile stretch of street for two year to cleanup the public right-of-way. Click on the link to see which streets are available for adoption. PWD coordinates the Private Haulers Franchise, under which we regulate the private haulers that operate within the City. All entities that engage in the collection of waste need to obtain a Franchise to work within the City limits. Going Green is the latest trend, we only have one earth and we need to take care of it now before it is too late. Please try to do your part in any way that you can. The City of Doral Environmental Advisory Board (DEAB) meets every month to discuss environmental issues, policies and possible sustainable solutions. Everyone interested in attending can check the Events Calendar for upcoming meetings. Help create public involvement into the Committee's work and provide solutions for our future generations. Our offices are located at City Hall, 8401 NW 53rd Terrace, Doral, FL 33166. Our hours of operation are Monday-Friday 8:00 AM - 4:30 PM.